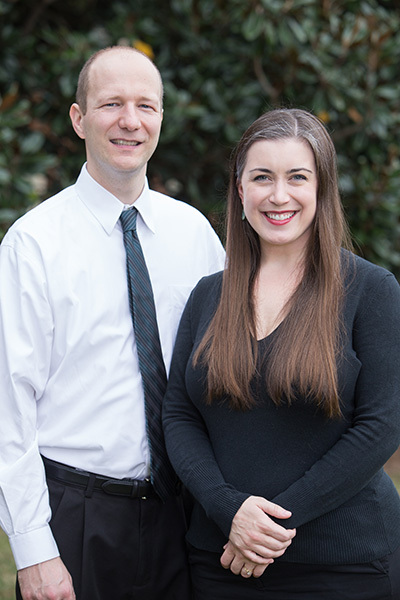 Bonus fact: Kenning and Viliunas met when they joined the Samford faculty and later married in 2015. Why do you teach? We both thought that we would remain full-time performers, but having the opportunity to teach in graduate school led us down a wonderful new path. We had great admiration for our own teachers, and it was satisfying to be able to inspire young musicians in a similar way. We are spirited, invested teachers and enjoy the challenge and reward of training students. We were drawn to Samford's mission and to job descriptions that seemed to be describing us. You both maintain active performing careers. How does that support your teaching roles? Maintaining performing careers while teaching can only help to keep us up-to-date on new music, world-class performers and expectations our students will face upon graduating. Remaining challenged and fulfilled as artists ourselves helps us have the energy to encourage that in others and helps us guide students as they begin their careers. What is your favorite activity outside of Samford? Watching our son Robert grow. "Dada" is his first word, but he calls everything "dada" so we're not sure if that really counts. He was mesmerized by his first opera at 6 months, sitting completely still for an hour. Then, well, he fell asleep, but we don't hold that against him. What advice do you have for students who eventually will also need to manage active performing careers and family? If possible, delay having kids until you've established yourself professionally. We both agree that we wouldn't have been nearly as ambitious if we'd started our family earlier. We also agree that if we'd met a decade ago, we'd probably have four kids by now. We had no idea how awesome being parents was! Something we tell our students: "You will never have more free time than you do right now." How did your backgrounds prepare you for your current roles? We were lucky to both grow up in families that highly valued music education. Our parents drove us to hundreds upon hundreds of lessons, recitals, competitions, and auditions. We are highly committed to our craft and have trained across the United States and Europe. We grew into our roles as orchestra conductor and opera director as a natural progression from being soloists and ensemble members—at some point, after watching so many others lead rehearsals and performances, we had ideas of our own that we were ready to share. What is one thing you want your students to know when they graduate from Samford? That they are valuable. That they were given unique talents to share with the world, and that no one else has their particular voice or sound or perspective. Through perseverance and tenacity, they can achieve their goals. You met at Samford. Tell us that story. Though we were both hired in the same year, we didn't know each other before coming to Samford. We became good colleagues and collaborated often on projects, and then, three years in, we decided to date. We had an easy rapport with each other from the start. Being Midwesterners, we communicate similarly and understand each other easily. Finally, someone to laugh at our corny jokes! Someone who wants sauerkraut for dinner! We married two years later, and now have a Southern baby. We hope he doesn't mind our accents. What is a favorite project you have worked on recently? Brian just finished recording a CD of Brahms Clarinet Sonatas with fellow faculty member Ron Shinn and recently returned from playing Hercules and Vampires with the Arizona Opera. Kristin is currently working on a new opera that Samford commissioned entitled The Ghosts of Gatsby with composer Evan Mack and librettist Joshua McGuire. The story shines a light into the relationship that Alabama native Zelda Fitzgerald had with her famous husband. The first draft of the vocal score is ready for Samford singers to workshop in the spring, and the orchestral score will be ready for Brian to conduct at the premiere next year. The Ghosts of Gatsby is very exciting for our students and Samford community.